On January 10th of this year, I lost my Dad to this dreadful disease. Alzheimer’s is a form of progressive dementia, where the brain cells gradually stop functioning or die. The disease usually occurs in adults over the age of 65. This used to be past the typical age for retirement, but that isn’t true anymore. Largely due to the 2008 recession, 62% of all employees between the ages of 45 and 60 have planned on delaying their retirement. That means we have an older workforce that is more likely to experience problems with Alzheimer’s in the workplace. 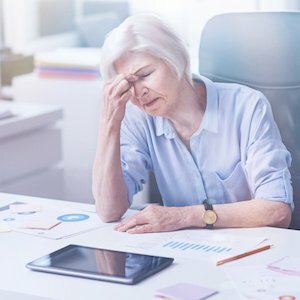 In fact, according to The Society for Human Resource Management, 35% of Human Resources staff have experienced employees showing signs of the disease. According to DailyMail.Com, so far in 2018, over 6 million Americans have been diagnosed with the affliction. Researchers anticipate that by 2025, 7.1 million people will be living with Alzheimer’s. The disease has no cure and the current treatments can only slow its development. 2. repeatedly loses things or does not follow up on assignments. 3. exhibits a loss of performance and/or motivation. 4. consistently misses meetings or shows up late. 5. repeatedly misses job-related deadlines. 6. has trouble finding the right words to express in conversations. – Denial. It is especially common for men to dismiss the signs of illness, refusing to see a doctor. – Stigma. Simply put, many people abhor being associated with the disease. – Fear of employment termination. – Worry about discrimination against them. – Confidentiality. People are worried that others will find out their condition and that perceptions could impact their social status, salary, job, and health insurance. 1. Show compassion for employees and their families. 2. Eliminate less meaningful job functions to enable focus on more important priorities. 3. Encourage employees to seek assistance through their Employee Assistance Program (EAP). 4. Provide additional training time for those who need it. 5. Post written or visual instructions for using workplace equipment. 6. Use color-coded written instructions to indicate the work tasks level of importance. 8. Supplement written instructions with voice-recorded messages. 9. Encourage employees and their families to review their rights under the Americans With Disabilities Act. 10. Arrange employees’ materials in the order in which they are used. 11. When possible, give simpler tasks to employees who begin struggling with tasks. 12. Reassign employees to a job position that better matches their current skills and abilities. If you can keep valued employees working, it can be a win-win. 1. Go see a doctor. 2. Get tested for Lyme disease. It has similar symptoms and different treatment options. 3. Use memory aids to help you organize the details of your job. 4. Talk to your employer and physician about leave of absence choices if you feel you are not keeping up with the job at hand. 5. As referenced above, review what options are available to you under the Americans With Disabilities Act. 6. Regularly exercise your brain with games and puzzles such as Sudoku, Jigsaw Puzzles, Scrabble, etc. 7. Consider supplementing your diet with the following 5 herbs that are proven to help with memory loss: turmeric, ginkgo, salvia, ginseng, and Chinese club moss. If someone in your life is starting to exhibit the signs of Alzheimer’s, I urge you to be direct and try to help that person. It can be an uncomfortable but necessary conversation. The sooner people are diagnosed, the sooner they can begin treatment that will improve their quality of life. On September 15th, I did the Chicago Walk to End Alzheimer’s. If you want to contribute to the effort to eradicate this terrible disease, please donate. This entry was posted in Blog and tagged leadership, talent management on September 17, 2018 by Kevin Sheridan.